These homemade donuts are cut from a yeast dough, fried, piped with a raspberry jam, then dipped in a crunchy glaze made with peanut butter, confectioners’ sugar, butter, and cinnamon. What better way to combine PB&J?! Make these yummy treats for Hanukkah! 1. In the bowl of an electric mixer (fitted with dough hook), combine yeast, milk and a pinch of sugar. Let stand until frothy, about 5 minutes. Meanwhile, whisk together flour, nutmeg, salt and sugar in a medium bowl. In a separate bowl, whisk together 7 tablespoons butter and eggs until thoroughly blended. 2. Whisk in butter and egg mixture into milk mixture. With mixer on low speed, add flour mixture in ¼-cup spoonfuls. Continue to beat dough after flour is added until dough pulls away from sides of bowl, about 5 minutes. Brush bowl and top of dough with remaining butter; cover with plastic wrap and refrigerate overnight to rise. 3. Line 2 baking sheets with parchment and lightly dust with flour. Divide dough into two portions; roll each into ½-inch thickness. Use a lightly floured 2-inch round cutter to cut dough into rounds and transfer to prepared baking sheets to rise until doubled in volume, about 1 hour. 4. Meanwhile, make glaze: heat butter, peanut butter, confectioners’ sugar and cinnamon in a medium saucepan until combined. Set aside and stir occasionally. 5. Pour oil in a medium saucepan to a depth of about 2 inches (about 6 cups). Heat oil over medium until it reaches about 370°F. Working in batches of about 3 doughnuts at a time, fry doughnuts until golden brown, 1 to 2 minutes per side. Use a slotted spoon to transfer doughnuts to a paper-towel lined baking sheet. Let doughnuts drain until cool enough to handle, about 5 minutes. 6. Spoon jam into a pastry bag fitted with a metal tip. Insert tip into one side of doughnut; press in filling until doughnut bulges. Dip doughnuts into glaze, transferring to a wire rack as they are dipped. 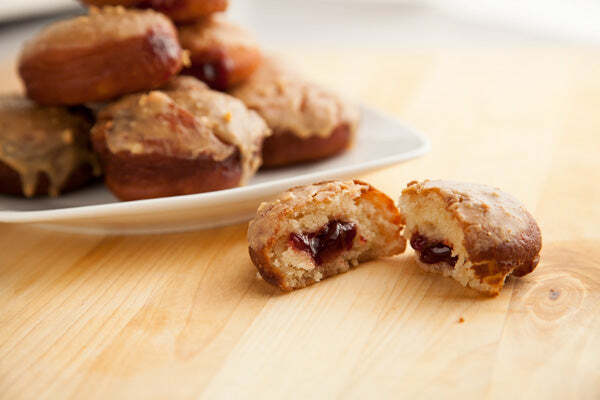 The post VIDEO RECIPE: PB&J Doughnuts appeared first on - Peanut Butter & Co. Recipe Blog.